Both the PS5 and Xbox Two are coming. We know this as both Sony and Microsoft have admitted as much and, in the case of the next PlayStation, it looks set to land sooner than anyone thought, with boys and girls set to unwrap new PS5 consoles come Christmas 2019. Microsoft and its next Xbox console, code-named Xbox Scarlett, isn't far behind either, with a Christmas 2020 release lined-up by the American maker. Microsoft seem very confident in the Xbox Two as well, with Xbox boss Phil Spencer claiming that they will "again deliver on our commitment to set the benchmark for console gaming." But, bluster and covert operations aside, which system currently looks likely to win the next generation console war? Will it be the PS5 or Xbox Two? Let's take a look at how things stand. Many PlayStation fans were rightfully disappointed when Sony Interactive Entertainment CEO, John Kodera, said that the Japanese company was going to "crouch down" for a period to "jump higher in the future", with no new PlayStation console launching before 2021. Not only would that date mean loyal PlayStation customers would have to wait eight whole years before a successor to the PS4 hit the market, but also that Microsoft would get a year's head start in the next generation console sales war, with its Xbox Two console primed for a release in 2020. However, the latest evidence suggests that Sony could be running a secret, covert operation to launch the PS5 next year, with the next PlayStation console actually hitting store shelves in time for Christmas 2019. Cyberpunk 2077 running on Sony's next PlayStation is a tantalising prospect. And, not only does this Skunk Works-style plan include beating Microsoft's Xbox Two to market, but it also includes a scheme to take down Microsoft Xbox Live, with the latest industry whispers indicating that Sony is working on a big infrastructure/platform update for PSN in time for the PS5 release date. Sony's next-gen console plan also includes a stacked hardware and games armoury, with AMD's advanced Navi graphics tech reportedly being built specifically for the PS5, and a series of jaw-dropping, graphical juggernaut PS5 games lined up for release on the system. A 5G, streaming-focused, new PlayStation Portable (PSP) has been rumoured to be incoming alongside the PS5. Lastly, as a cherry on top of Sony's next-gen console offering, rumours have emerged that the Japanese maker is also lining up a 5G PlayStation Portable, allowing PlayStation fans to play stunning, graphically impressive games while on the go. Microsoft's Phil Spencer announced at E3 2018 that the next Xbox, code-named Xbox Scarlett, was currently being worked on, with reports stating that "Microsoft is aggressively moving ahead with hardware in the console space" and is "planning for the next Xbox console release to arrive in 2020." The follow up console to the Xbox One X, and full successor to the 2013 Xbox One, is no shrinking violet, either, with the Xbox Two's maker aware of the incoming PS5 threat and tooling up with a ridiculous suite of advanced features, stunning next-gen games, and phenomenal, crazy-fast hardware. Xbox boss Phil Spencer announced Microsoft was working on a new Xbox console at E3 2018. As well as also delivering enhanced cloud functionality and a two-tier console offering including a full fat Xbox Two and cheaper, smaller, steaming-orientated console tied into Xbox Game Pass, Xbox's Scarlett program also looks set to include smart new ways to buy the next Xbox, with the recent launch of Xbox All Access paving the way for Microsoft to make entering the Xbox ecosystem easier than ever. The result of all this for gamers? Games like Halo 6 and Cyberpunk 2077 running at 4K and 60fps, while the next-gen console also matching up to the PS5 in terms of hardware and gaming ecosystem. Halo 6 running at a 4K resolution and at 60fps on Xbox Two would be jaw-dropping. 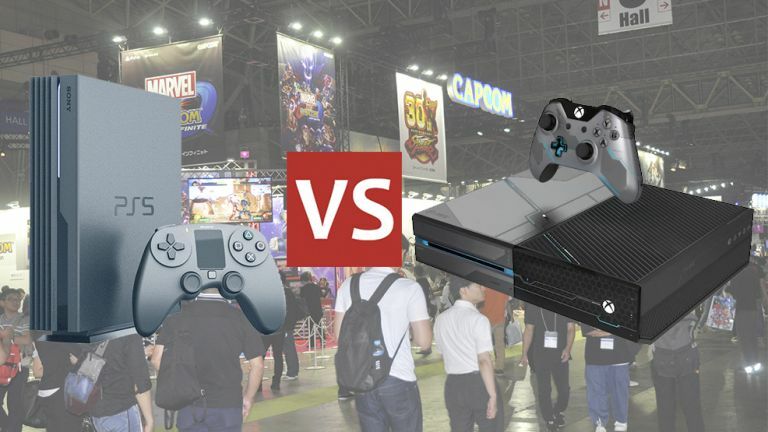 Which, leads us to the inevitable conclusion that both Sony and Microsoft's next-gen consoles currently look like they are very evenly matched. Sony's PS5 system, if that covert operation succeeds, currently looks set to release sooner and also seems very powerful. However, Microsoft's system doesn't look that far behind and seems well armed with top hardware and games to fight fiercely, too - which is something it will almost certainly need to do considering that twice the amount of PS4 consoles have been sold compared to Xbox One to date.